Hailed as revolutionary when first released way back in 1991, this collection of troubador songs from medieval Spain is still magnificent in its most recent incarnation. 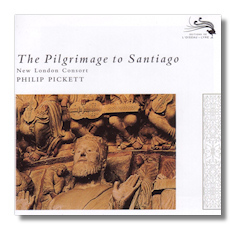 Philip Pickett has an inside knowledge of these simple yet striking pieces and the New London Consort plays with such dedication and passion that it is difficult to imagine this particular interpretation being surpassed. The two discs contain a vast collection of songs from four different locations; Navarre, Castille, Leon and Galicia. It is beyond the scope of this review to delve into the different aspects of the music but it will suffice to say that it is enthralling from first note to last. The highlight remains the final tribute to St. James which ends both discs, one instrumentally and one with chorus, the momentum of the music is quite irresistible. If you missed this issue first time round, then it is essential to acquire it now in splendidly remastered sound although sadly the original scholarly notes have been replaced by a retrospective essay.